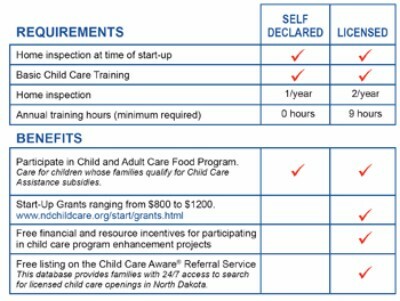 Child Care Aware of North Dakota : Child Care Start Up : Self-Declared : What is a Self-Declaration Document? Self-declaration documentation and licensing are similar, but a self-declaration document is not a child care license. Take some time to compare the requirements and benefits of self-declared documentation and licensing. You will see that licensed providers must meet a few more requirements, but they also gain some valuable benefits. Regardless of your choice, Child Care Aware® of North Dakota can provide you with guidance as you start your new child care.